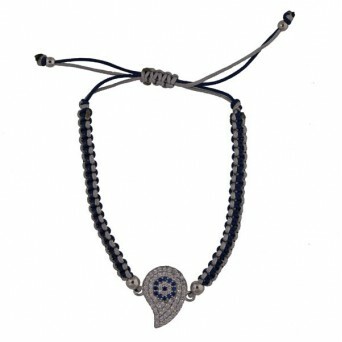 Handmade macrame evil eye bracelet with blue and white ceramic, blue cord and little balls of gold plated silver 925o. Handmade rose gold plated sterling silver charm bracelet with 3 drop eyes made of silver and black, .. Handmade rose gold plated sterling silver eye circles earrings with blue, black and white enamel. .. Handmade rose gold plated sterling silver round eye earrings with blue and white enamel. - Prices.. Handmade rose gold plated silver round target eye pendant whith black and white enamel on rose gold ..